A solid revival of the Tennessee Williams classic speaks to oppression both emotional and economic. 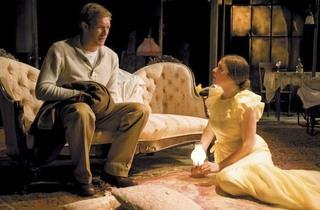 William Boles’s set design establishes the mood for the ubiquitous memory play. The wallpaper in the St. Louis apartment is shabby and peeling, the floor layered with stained, faded rugs; outside, factory windows surround the place like fortress walls—the prison that Tom (Aaron Roman Weiner) longs to escape. More than in any other Menagerie I’ve seen, Weiner gives the sense of the future narrator stepping back into his memories. Kathy Scambiatterra’s Amanda is a frivolous Southern belle whose concern for shy daughter Laura is palpable. The appealing Leah Karpel makes Laura’s damage more emotional than physical (no exaggerated limp here). Director Laley Lippard’s best work comes in the scene between Laura and her gentleman caller (Brett Schneider, giving Jim an aw-shucks straightforwardness).